This module is the fourth and final entry in the Volcanic Ash series. It covers the tools and techniques used for identifying and forecasting the transport of volcanic ash. Satellite and radar imagery are combined with observations and numerical model output to first identify the presence of volcanic ash and then to help forecast the transport of ash at various levels of the atmosphere. This course is very strong on the sciences of volcanic ash observation and will help in your studies to learn more about how hazards of volcanoes are determined. I have a master's degree in Geology, and have been teaching it for 16 years. I found this course EXTREMELY frustrating. It assumed that I already knew several things. For example, what those little arrow/feather things were to indicate wind direction. No clue. The difference between polar orbits and equatorial geosynchronous orbits? It was mentioned that there are these two types, but that's it. Verbal explanations were given for questions, but not annotated on graphics. Quite frankly, I guessed on most of the answer. I should not have to go to outside sources in a course to get the answers. A well designed course should lead the student to the correct answer. For me personally, it is somewhat difficult to get a feel for the different products without hands on experience. Plan on re-doing this particular section of this lesson. Question 1 on the quiz is not working properly. I used multiple computers with multiple browsers (IE, Firefox, and Chrome) but had no luck with it. this is educational accridation for me as well as on the job training. This module is a bit dry, but the over all course is good. 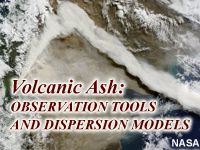 Utilize available remote sensing, model data and observations to evaluate the presence of volcanic ash. Describe the strengths and weaknesses of various satellite and radar products. Forecast volcanic ash transport and dispersion using all available observations and model output. Use HYSPLIT model output to determine areas that will be affected by volcanic ash. Develop forecast products that inform customers of potential volcanic ash hazards. November 6, 2013: The Introduction section contains new information about World Volcanic Observatories, Volcanic Ash Advisory Centers, and Aviation Color Codes. The section on Identifying Presence of Ash includes new examples focusing on the 2011 eruption of Puyehue Cordón-Caulle in Chile. The Puyehue Cordón-Caulle eruption is also used in the Plume Spread and Issuing Products sections.